Elaine Adair Pieces: DOING IT is the art! 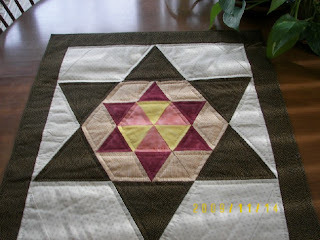 Our Ardis Wannabe Guild Challenge (artist want to be) pulled from the bag last month was a Sheriff's 6 pointed Star. I've never made a 60-degree star, so armed with TWO $20.00 rulers, and no pattern I cobbled along, and managed to make this honker of a star! Finished project is about 24 inches square. I DO love the colors. Whew - big, bold, DONE! The ART will have to be in the process this time. Wouldn't this make the center of a little boy's quilt? We sure see a lot of cowboy fabric! One block and two $20 rulers. I think you need to make some more! I never thought of it as a sheriff's star, it's always been the star of David to me! I love the design, though. Looks super! I really like the star inside the star. Do you plan to make more with stars that are progressively larger? That would give your new rulers a work out. Oh yes, now that you've made the investment, you must make more of these! I love to work with 60 degree triangles and diamonds. Yours turned out nice. Are you getting snow? Winter storm warnings tonight with up to 16" in the north central mountains. loved your ardis wannabe - will put everyone else's to shame. I picked out my material at Pat's the other day for Bonnie Hunter's class so now I will have to make it if I don't get into class. Loved your friends quilt also. Just beautiful. I am really impressed. I don't think I could do any kind of star without a pattern. Beautiful. Honker of a star! Love that description. You do need to make a cowboy quilt now, with at least a big star like this in it! Nice looking points - it is nice to challenge ourselves once in a while. Great job! I think you figured out those 2 new rulers just fine.